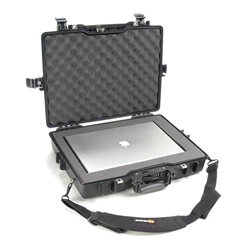 Pelican case is watertight, crushproof, and dust proof with an open cell core and solid wall design in order to be strong as well as light weight. Designed with a watertight o-ring seal, automatic pressure equalization valve and stainless steel hardware. This case is protected by Pelican's Lifetime Guarantee of Excellence. Special order colors available: Desert Tan. Interior Dimensions18.87" x 13.12" x 3.81"
Exterior Dimensions21.62" x 17.25" x 4.87"
Shipping Dimensions22" x 18" x 6"
Inside 2" Foam Lined Dimensions14.87" x 9.12" x -0.19"